Benjamin Rucker (June 6, 1889 – April 15, 1934) was an American stage magician, better known by his stage name Black Herman. He was the most prominent African-American magician of his time. He was born Benjamin Rucker in Amherst, Virginia on June 6, 1889. Black Herman learned the art of staged illusions from a performer called Prince Herman, who was first his teacher and later his partner. The two sold patent medicine as well as performing prestidigitation, making their act as much a medicine show as a stage show. When Prince Herman died, in 1909, Rucker, then only 17 years old, took the name "Black Herman" in his friend's honour and continued to tour, focussing on the stage act and dropping the medicine show aspects of his performance. Eventually, Herman made Harlem, New York City his home base. Jim Crow policies were in effect at that time, so in the Northern states he could perform before racially mixed audiences, but when he traveled through the South, often with his own tent show, segregation laws kept his audiences primarily black. His specialties included the Asrah levitation, the production of rabbits, release from knots tied by audience members, and a "buried alive" act which began with his interment in an outdoor area called "Black Herman's Private Graveyard" and continued three days later with his exhumation, revival and a walk to the stage venue, where he performed the rest of his show. 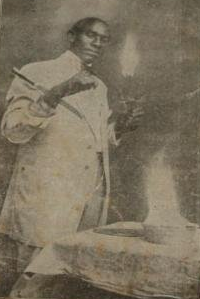 Herman was the ostensible author of Secrets of Magic, Mystery, and Legerdemain, published in 1925 that contains his semi-fictionalized autobiography, directions for simple illusions suitable to the novice stage magician, advice on astrology and lucky numbers, and a sampling of African-American hoodoo folk magic customs and practices. An announcement on the book's title page, "Black Herman Comes Through Every Seven Years", referred to Herman's pattern of returning to venues on a regular basis; the book was sold at his performances, although it has been determined that he was not the author. Black Herman died ged 44, in Louisville, Kentucky, in April 15, 1934, after collapsing on stage, presumably the result of a heart attack. Due to the fame of his "buried alive" act, many people in the audience refused to believe he was really dead, and thus it came about that his assistant, Washington Reeves, charged admission to view Rucker's corpse in the funeral home, bringing a dramatic close to a life spent in showmanship. He was buried in the Woodlawn Cemetery in Bronx, New York City. ^ a b Kraven, Vlad. "Black Herman the Undead". Retrieved 16 May 2011. Born in 1892 [sic], Benjamin Rucker started his career as an apprentice to a traveling magician and 'miracle' medicine salesman named Prince Herman. ^ a b c "Black Herman". Magic Tricks. Retrieved 2016-12-20. ^ "Hold Funeral Services Here for Benjamin Rucker, Known Nationwide as the Magician, 'Black Herman'". New York Age. April 17, 1934. Black Herman [Benjamin Rucker]. Secrets of Magic, Mystery, and Legerdemain. 1925. Republished in 1938 first by Empire Publishing, then by Dorene Publishing. This book was ghost-written by Mr. Young, who is also presumed to be the author pseudonymously known as Henri Gamache. Haskins, Jim and Kathleen Benson, Conjure Times, Walker & Co., New York, 2001. Patton, George. Black Jack: A Drama of Magic, Mystery and Legerdemain, Bloomington, IN: iUniverse, 2009.